Weather Impact On Cargo Operation In Northern States - V. Alexander & Co., Inc.
We continue to experience extreme weather conditions across most regions in our network with temperatures well below normal in the US Midwest, Central and Eastern Canada and in Western Canada. Last night in Winnipeg MB the low was -52 C. At these temperatures even with tier 3 restrictions many trains simply cannot move. While we will see temporary warming in the east and US Midwest in the coming days it will be short lived. Temperatures are expected to remain below normal in the coming weeks. As a result of these harsh conditions our neatwork is moving slower with car supply for both inland terminals and ports being interrupted at times. It is important that expectations for service levels during this time be tempered. Transits will on average be longer during this time. Following heavy snow on the weekend Brampton is experiencing extreme cold temperatures with wind chills for the next 2-3 days below -30C. With the slower arrival of car supply and shorter arriving trains we are forced to manage export train reservations to ensure what comes in can be moved out. Similar to Toronto Montreal is dealing with the harsh weather conditions and the impact of winter rail operations. For the most part the terminal is fluid. Some reservation capacity at times is being tightened pending car supply to move out exports but overall the terminal is running well. Edmonton and Calgary: We have made headway with regards to the Deltaport backlog however with the colder weather we are seeing reduced inbound cars to support loading. We continue to manage export loads making all efforts to ensure vessels cut offs are protected. Joliet: As noted prior Joliet like all terminals is being impacted by severe weather conditions. Overall Joliet has made headway with the backlog of exports. We had a crane down to start today which created some delays but all cranes are now up and running. Harvey: Despite the harsh operating conditions Harvey is operating well. While we continue to restrict empty export flows capacity has been increased since last week. We are seeing high import dwell as the cold temperatures are impacting truck power. We encourage customers to make all efforts to remove your imports from the terminal. We expect heavy inbound trains through the weekend which could lead to longer service times to start the week. Detroit: Detroit is operating well considering the conditions. We have had some yard delays caused by congestion at peak times of the day but the terminal continues to operate much better than this same time last year. Crane reliability is much improved vs. last winter. Memphis: Memphis is in good shape and the chassis supply is improved. We do have a backlog of Deltaport empty export containers which we are working to address over the next week. Chippewa Falls: With the colder temperatures we are seeing a reduced car supply as trains are unable to stop on the mainline to set out freight for Chippewa Falls as they will lose their air pressure. We expect to see delays for both imports and export until the temperatures moderate. Long term models show a warming trend for the northern mid-west starting next week. Overall import demand remains strong as we continue to see high import volume ahead of the Chinese New Year. While we have good pipelines to all ports we are seeing delays in transits due to the weather conditions. The sporadic arrivals of shorter trains at our inland terminals and the restrictions for outbound loading mean that we can expect shortfalls in car supply over the next 7-10 days or longer depending on the weather. Prince Rupert: Dwell has risen to approx. 6 days. We have lost production this week due to late car supply. This cold snap is occurring at the same time we are seeing a spike in imports this week. We do expect the dwell to reduce in the coming 7-10 days. The pipeline is solid but there are delays getting the cars into position. Deltaport: The average on dock dwell has been approx. 5 days. We have lost some ground with late spots and shorter car supply with gaps in trains arriving from the east due to weather conditions. Trucking is being maximized provided VIT has car supply to move the imports out. Vanterm: Avg. prohected dwell remains at approx. 6 days. NOTE – Vanterm has halted all VESSEL operations due to a vessel striking a dockside crane. Rail operations are not impacted at this time. We are waiting on more information on this topic. Centerm: Avg. dwell is approx. 5 days for traffic currently on the ground. FSD: Average dwell is at approx. 5 days. Pipeline is solid as we have cars staged in the Vancouver area with exports for the port to process. Halifax – Ceres and Halterm are both in very good shape. As of today both ports are effectively grounded out. There may be some longer than typical dwells next week as the inbound trains will be smaller due to the cold temperatures over the next 3-4 days. Port of Montreal – Sporadic labour issues continue to impact loading at all ports. Vessel arrivals are being impacted due to ice conditions on the St. Lawrence. Racine is in good shape with enough cars on the port and arriving today to clear the current ground count. Extreme arctic air has begun to move out of Chicago, the upper tier of the US Midwest will revert to “normal” winter conditions / intermodal operations by Friday, 2/1. Seeing signs that the Chicago interchange velocity is improving today vs the past 48 hours, we expect performance to improve as temperatures rise above freezing this weekend. ONE will continue to monitor conditions / backlog on both sides of the interchange until full recovery. NS domestic, empty and BN lane closures remain in effect for traffic moving through / to Chicago but no indication of new lane closures, all NS ramps are receiving westbound exports however delays are expected into next week. Council Bluffs / IAIS-UP reopened this morning, no rail facility closures although terminal operations continued to be hampered by the weather today in the upper US Midwest and Ontario. UP announced that Thursday (in addition to Wednesday) will be considered a “free day” at Chicago area terminals (including G2, 3, 4), however no other blanket free time extension has been announced by the other class I railroads. CP is advising combination of winter plan train length restrictions plus a non-intermodal (grain train) derailment in North Dakota will slow car supply to Deltaport early next week – this is anticipated to be a short term impact however network rail will continue to monitor secondary impact of the weather event on the western carriers’ ability to cycle assets back to the west coast ports next week. Extreme arctic weather continues to plague much of the Midwest with dangerously cold wind chills and historic low temperatures. All of the Norfolk Southern Intermodal facilities in Chicago remain open and we are conducting operations as conditions allows. The extreme temperatures have greatly reduced drayage support in the Chicago area which is creating congestion in our parking lots and storage yards. 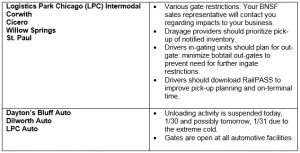 To help improve parking, drivers in-gating shipments in Chicago will be required to out-gate a shipment. The temporary closures will not impact loaded interline shipments billed through Chicago via steel-wheel interchange with the exception of select destinations on western rail carriers. Customers may experience increased dwell on Chicago destined shipments originating at eastern ports as Norfolk Southern has asked for reduced outbound loadings through the duration of the of the weather event. Effective 12:00pm Thursday, January 31st, the Harrisburg ingate will reopen to shipments billed to these destinations. Other facility ingates will reopen as operations and conditions allow. Winter Storm Jayden is now spreading snow and rain across the Northeast and Mid-Atlantic. Winter storm warnings and winter weather advisories continue across the Great Lakes region. A blizzard warning is also in effect for parts of the Upper Peninsula of Michigan until early Thursday. In addition, air cargo operations are severely impacted, with U.S. airports including Atlanta (ATL), Chicago O’Hare (ORD), Chicago Midway (MDW), Detroit Metropolitan Airport (DTW), Milwaukee (MKE), Minneapolis/St. Paul (MSP) and St. Louis (STL) suffering flight delays and cancellations (in the UK, Manchester Airport [MAN] has also seen major cancellations and delays due to weather conditions there). In the US, 8,937 flights have been delayed and 2,929 flights have been cancelled today, with the greatest concentration of delays at ORD and MDW. Delta Cargo issued an embargo on its operations at MSP and DTW on all domestic origin, transfer and destination shipments, along with U.S. export and transfer shipments, until Thursday, Jan. 31 at 11:59 p.m. EST. International cargo flying to MSP and DTW cargo are excluded from the embargo. American Airlines had 222 flights cancelled and 102 flights delayed today. American Airlines Cargo has not released any details on its operations alerts related to the impact of weather on its operations. Swissport, which handles American Airlines’ cargo operations at ORD, advised that despite a slowdown in operations at the airport and the inability of some employees to make it to work due to impacted public transport, its clients have experienced no issues and that its warehouse is working fine. A winter storm warning is in effect through Thursday for an area stretching from the Michigan peninsula down through Missouri. The Polar Vortex-created winter storm Jaden is bringing three to six inches of snow to the area, along with dangerously cold winds. Class 1 railroads may have to shorten train lengths and reduce speeds to cope with cold, while drayage supply will also be tight. Imports into Union Pacific Railroad’s Global IV terminal have been grounded until chassis are available to mount containers. BNSF has been able to move containers out of its Logistics Park Chicago (LPC) terminal, but draymen said there are multi-hour backups to return empty containers. The railroad warns that service levels at its Chicago and St. Paul intermodal facilities will be impacted by driver availability and slower turn times. BNSF advises that frigid temperatures cause “reduced production levels at our Chicago area facilities. Customers may also experience additional challenges with driver availability and slower turn times. “This extreme cold creates challenges for our trains’ braking systems because of reduced air flow. In response, train length restrictions have been implemented in this region. Some trains have also experienced delays due to this difficult operating environment,” the railroad said in an advisory. BNSF says it will shorten train lengths in the Midwest due to the extreme cold because of the potential of braking systems being impacted by reduced air flow. Train velocities will also be impacted “due to this difficult operating environment,” BNSF said in a statement. Norfolk Southern advises that its Chicago intermodal facility is seeing a decline in “drayage support” as the extreme weather hits the trucking industry. The railroad will not permit empty containers to be returned in Chicago until further notice. Domestic service into Chicago from Ayer, Massachusetts; Charlotte, North Carolina; Columbus, Ohio; Albany, New York; Taylor, Pennsylvania; and Norfolk, Virginia, will be closed to loaded shipments. International volume into Chicago from Charlotte; Jacksonville, Florida; Norfolk; Detroit; and the major cities in Ohio will also be impacted. “All of our intermodal facilities remain operational at this time, however, additional closures may be needed based on the impacts of the storm,” the railroad wrote. Various ocean carriers and railroad operators advise that inclement weather conditions in the North/Northeast are impacting rail operations, especially to and from the Midwest including Chicago. Rail traffic from the Northeastern US into the Midwest, especially Chicago, will be impacted by this situation, up to closings of certain rail connectors. Canadian rail carriers (CP & CN) have already implemented winter contingency plans which include operating shorter intermodal trains at slower speeds. Canadian networks already experience an impact on car supply in Vancouver due to both CN and CP running trains at shorter lengths and slower speeds.. Although Union Pacific has not reported a significant impact to velocity over their central corridor (Chicago to the PNW) it is monitoring for possible impact. Our Operations Teams are monitoring the situation and will advise any delays that should occur, please feel free to check on specific shipments with them too.